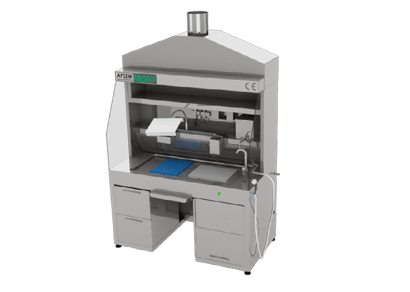 Backdraft Pathology Grossing Workstation | CE | Apzem. APZEM Premium series Grossing Station were designed to provide Sturdy, customizable and affordable workstation for medium to large Labs. The premium series workstation comes with higher suction capacity and additional features that assists in grossing as well as protects you from inhaling harmful formalin and other fumes while grossing. Mobile storage cabinet with draw arrangement for storing. Compact storage box with lock and key. Additional self contained exhaust blower for Increased suction.